I have super sensitive teeth and soft teeth enamel. So, anything which promises teeth whitening, makes my teeth ache for no reason. I tried a couple of teeth whitening toothpastes in the past and believe me I regretted my decision every single time. When I was asked to try out the brand, my first intuition was to not accept the offer. I didn’t want to go through the trauma again. 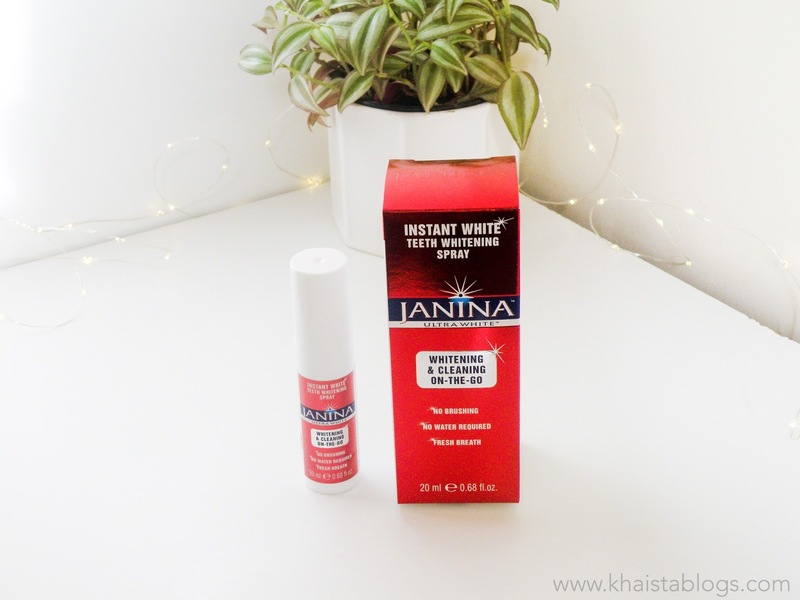 Then I searched about the products and found out that Janina ultra-white teeth whitening products are suitable for sensitive teeth. Fast forward all the process and here I am written down my experience. Charcoal toothpaste contains, as the name stated charcoal, to lift stains. I don’t have any visible stains but I am a curry eating specie. And it leaves sometime a tinge behind. Charcoal toothpaste comes in a squeezable plastic tube and comes out grey, which feels weird at first sight. It has very nice light minty fresh taste. Along charcoal it has Bromine complex, a combination of fruits enzyme to gently whiten teeth. I have been using it for last three weeks and I didn’t experience any sensitivity at all. My teeth look noticeably whiter. You may not find drastic result after first use since it is very gentle and low abrasive. However, with constant use the results are promising. It is not abrasive at all, just a regular toothpaste performing exceptionally well. This is probably my favourite product. Just spray a product in mouth, swish it around and spit out. No brushing or water required. It is ideal for teeth whitening on the go, leaving breath minty fresh. It has papain from papaya and sodium fluoride. It is a perfect handbag companion. To be honest, I didn’t try out teeth whitening foam. Although the idea of this product is very fine. It is a toothpaste in foam form in a bottle, making it suitable for travelling. No more ‘toothpaste bursting in wash bag’ drama whatsoever. This toothpaste has Oxygenating Technology and Sodium Percarbonate. I didn’t use it because it has Alcohol in ingredients list. I suffer from dry mouth and dry lips, so I avoid any oral hygiene product which contain alcohol. I believe it worsen the situation. If it is not bothering you, then you must try it. I was wary to use the whitening trays for a week. As I stated earlier that I have sensitive teeth. So naturally I was not gravitated to this product. But once I tried, I am converted. It is a life changing product. It’s a five days’ intensive treatment for up-to 7 shades whiter teeth. The pack contains 10 pre-filled soft silicon trays for upper and bottom teeth. These trays fit in mouth quiet comfortably. Leave the trays for 35 minutes. Discard it and rinse out any remaining product. I could see the results immediately. It was unbelievable. I didn’t experience any sensitivity while using it. I used it before bed and I will suggest it that way. I will give teeth some time to relax and enamel to harden again. It’s an easy way to whiten teeth at home, perfect to use before any special event for dazzling white smile. I am already planning to get another pack because my other half is also very intrigued to try it out. Plus, it is a handy product to have in the bathroom cabinet to maintain the whiteness and shininess of teeth any time. Overall, I am happy with the whole range and couldn’t it recommend higher. All products work in a very gentle manner without eroding the enamel and increase sensitivity. The cardboard packaging of whole range is very interesting and vibrant which complement the range nicely. 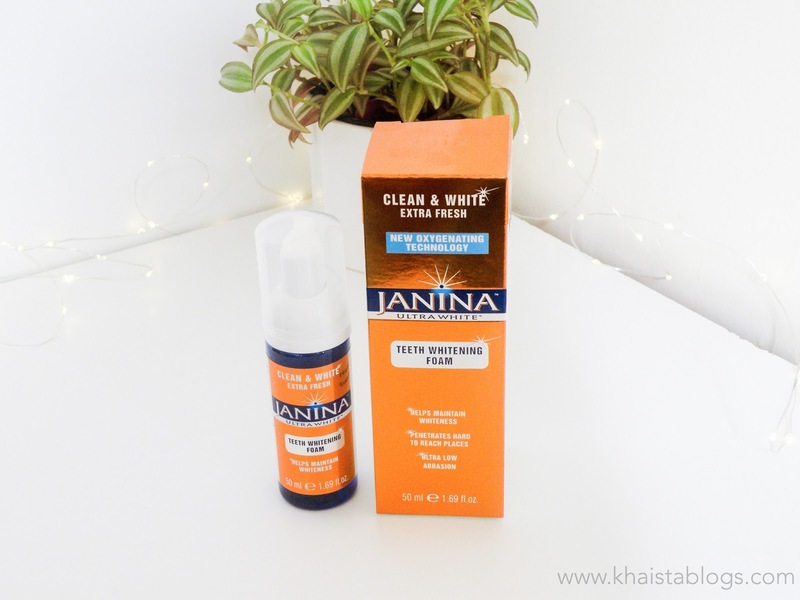 Janina ultra white teeth whitening range is vegan. 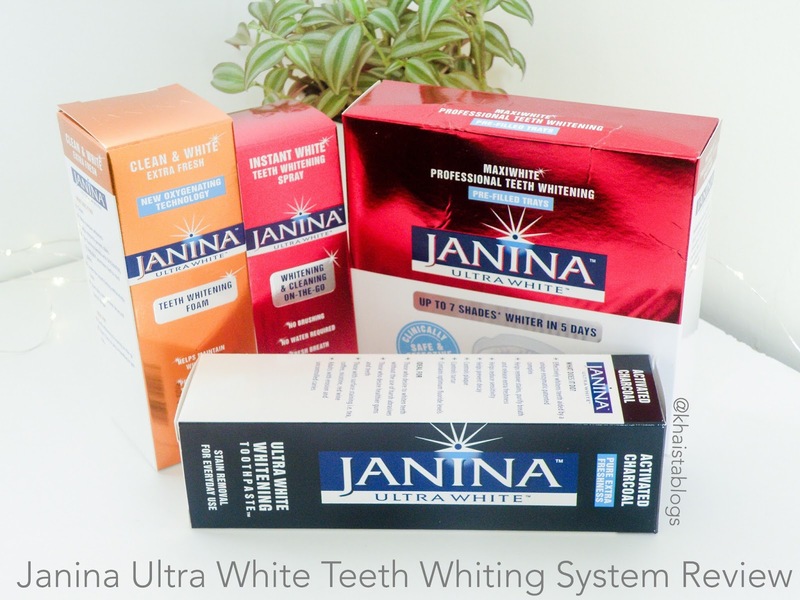 Janina ultra white teeth whitening range is not recommended to be used by under 18 persons. The whole range is not suggested to be use by pregnant ladies and if lactating. If you suffer from any gum disease, gingivitis or use dental braces, this range is not recommended. Disclaimer: This article contains PR samples. The reviews here are reflecting my thoughts only based on my experience. I always try to give my best opinion on every product I use. However, no product works the same for everyone. I cannot guarantee that the product will work the same for you. Always seek medical help before investing in such products if you are not confident enough. You know your body better. Nice! Will definitely keep an eye out of the market for these goodies! I am always trying out teeth whitening pastes so I will definitely give these a go! Looks good! 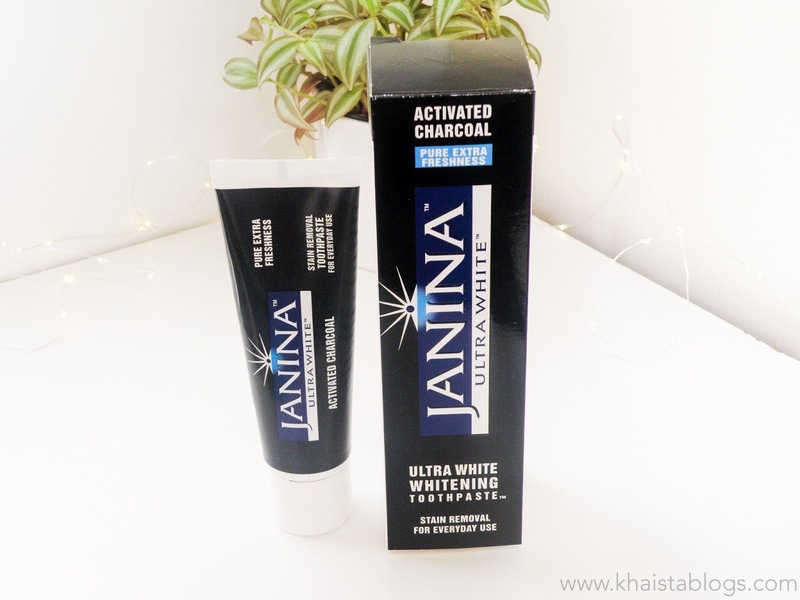 The Janina white teeth whitening range looks very good and affordable, my mummy has never tried teeth whiting before, but could do with it! It's great that you were able to use these products without any sensitivity problems, they did live up to their claims of being suitable for sensitive teeth. It sounds like they also give great results in regard to whitening. I like the sound of the spray, great product for on the go. Never tried all of those products. What I would like to try is the charcoal toothpaste and the teeth whitening. Will check more reviews about it. I want to try the charcoal toothpaste. This was a great review of products. My teeth need some help. Just recently I've noticed a mark on them that won't budge. These sound great! I love the sound of the spray and the toothpaste! I too have really dry mouth & lips though. A really interesting review, always wondering what these products are like and whether they're successful! I use whitening toothpastes at home although I don't use them all the time. They seem to work quite well. Yes it is easy to whiten teeth at home. Done it before. I will love to try this range. Its a big perk that they are vegan friendly! I love teeth whitening products but usually find they disappoint so will have to give this brand a shout! I've never heard of this brand but they sound incredible! I pride myself on keeping my teeth white so I will have to explore this brand asap! OMG most products get my teeth super sensitive, I am happy for you that yours eem to have held off. They sound good, want to try the spray as it sounds so simple. These sound really reasonable for whitening products, I like the sound of the toothpaste. I just went through the Enlighten Smiles program at the dentist. Good to know there are some at home kits but I've never found any to be amazing. Fantastic - I'd really like to give them a go, and as a fellow sufferer of sensitive teeth it's good to know that these are so gentle. This prevents the bacteria from growing in between the teeth ensuring a cleaner mouth and no damage to teeth.